« Arthritis and the Weather: Is There a Connection? Self-defense for seniors is not about the ability to physically overwhelm an attacker, it’s more about awareness — awareness of your surroundings and also of your own abilities and limitations. For seniors, the most important first step may be preventing situations that would require physical self-defense in the first place. The true ability to protect yourself comes from an awareness of your surroundings, a fearless presence, and an understanding of your actual capabilities. Nevertheless, there are techniques and behaviors that you can use to protect yourself if you are attacked. Don’t overload your arms with packages. Use a cart or make another trip. Park and walk in well-lit areas. Travel with someone else or a group whenever possible. Walk with purpose. Don’t look at the ground — look around you. Before leaving your car or a shop, observe your surroundings closely, especially if the area is unfamiliar, so you know where to go for safety. Always have your keys in hand, one finger looped through a key ring, when walking to the car or door. This keeps them more secure and helps you to turn them into a weapon to stab or scratch an attacker. Have a police whistle and a flashlight on your key chain. Carry as little cash and credit cards as possible. Hold only what you’re prepared to lose. Don’t slip a purse strap around neck — the attacker could use the strap to harm you. Most cell phones for seniors and some medical alarms have 911 connections — hit that at the first sign of trouble. Visit the bank during the day, instead of stopping by ATMs at night. If you must visit an ATM, use a well-lit, drive-thru location whenever possible. Never open your door to a stranger. Look out a window or keyhole first, and, if necessary, speak through the door. Chances for seniors to successfully avoid or fend off an attack greatly increase with your level of fitness, awareness, and knowledge. One proven, fundamental key to self-defense, as well as, general well-being is physical fitness. Any physical activity provides benefits, including improved balance, physical coordination, mental alertness, and overall fitness. Physical conditioning also enhances cardiovascular function; remembering to breathe ensures optimal muscle and brain performance to help fend off an attack. Regular exercise can include a fitness, martial arts, or yoga class; a daily walk; hiking; skiing; dancing; or other fun, physical activities. Being in better physical condition can also improve confidence. Be assertive and do not present yourself as an easy target. A thief or other perpetrator will look for a person who appears vulnerable and will not expect his victim to protest or fight back. Dodge. If someone starts to hit you, move aside and forward to avoid the blow. Don’t let anyone back you up against a wall or other object. If they’re striking at you, move to the side in a circle, not backward. If someone grabs you from behind, don’t struggle and pull to get away, even though it seems natural to do so. Rather, lean against the attacker and force your head back hard to throw the person off-balance. Some seniors feel safer carrying pepper spray, a stun gun or firearm; however, you must be licensed for many weapons and know how to use the weapon safely and effectively. Senior self-defense experts generally recommend not carrying items such as, tasers, knives, guns, and, in some cases, even mace or pepper spray. An attacker could easily use these weapons against you. Learning about self-defense for seniors is about becoming more prepared. 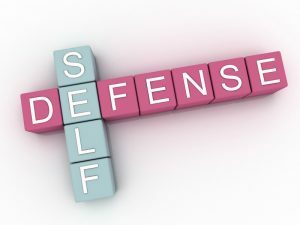 Self-defense knowledge and training provides an opportunity to improve well-being for you or a loved one by minimizing the chances of being attacked and gaining an advantage in case an attack occurs.